ALBION skipper Gordon Greer will miss Saturday’s Championship game at Blackburn Rovers on Saturday. Greer limped off late on during Tuesday’s 2-0 defeat at Rotherham and Seagulls boss Chris Hughton confirmed the central defender will miss the Rovers match. He said: “He’ll miss the game but it’s very slight. The good news is that it’s one where it’s more of a neural one than a specific injury. The Seagulls will otherwise be at full-strength, apart from the longer-term injured trio of Gaetan Bong, Liam Rosenior and Uwe Hunemeier. 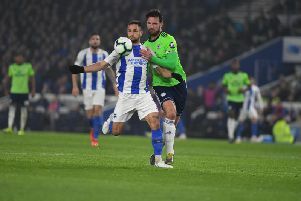 Of those players, left-back Bong is closest to returning and Hughton said: “From what we regard the longer-term ones, Gaetan would probably be the closest. He’s out doing some good running at the moment and some ball work, which is very encouraging. Central midfielder Richie Towell, who signed from Dundalk and made his debut in the FA Cup at Hull last Saturday, is also pushing to get into the squad. Hughton said: “I think that, sometimes, the difficulty when you have someone coming in at the time which Richie did, when you’re playing a lot of games, is the type of training that you’re doing can be quite sporadic and not so many 11 versus 11s, as such. “Certainly, on the day to day, he’s done very well and has settled in very well. Of course, it’s about bridging that gap between perhaps the level that he’s been playing and this level. Looking ahead to the Blackburn match, Hughton said: “They’ve got a very settled team, which is something to their advantage. “In Jordan Rhodes, who perhaps hasn’t got the goals of late that he is used to getting, they’ve certainly got one of the best strikers in the division.